This concept that a low fat, low cholesterol diet will lower heart disease risk is referred to as the “Lipid Hypothesis” by researchers. However, the “Lipid Hypothesis” is one big fatlie. This is still the paramount focus of our entire health care system and the advice on nutrition and health which our government propagates. 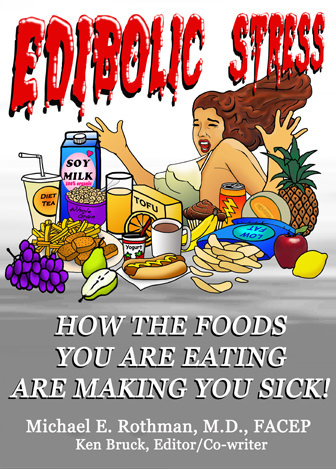 Preview Edibolic Stress – How the Lies You Are Being Fed Are Making You Sick! Highlighted Blog Post: Is Saturated Fat Bad For You? It’s amazing how the majority of doctors and nutritionists – even the Federal government – promote the concept that a low-fat, low-cholesterol diet will lower heart disease risk. This concept of removing fat in diet, to promote cardiac health known to researchers as the “Lipid Hypothesis” is actually one big fat lie. Frustrated with all the diet tips out there? Looking for less stress? More energy? If you’re confused about what to do, or wondering what’s best for you, you can be certain of at least one thing. Proper, individualized holistic health nutrition can do wonders for your body and mind. Michael Rothman MD presents evidence that many mass produced foods are laden with ingredients that are unhealthy and over time, contribute to degenerative conditions.